Nortek Powder Coating is a manufacturer of high-quality powder coatings. Established in 2005, the company offers a wide range of quality powder coating product choices and full technical support services. Located in Rome, NY the newly expanded facility consists of over 42,000 square feet. Nortek's manufacturing process and facility are designed to readily accommodate both large and small production runs, with a capacity of over 10 million pounds annually. In addition to manufacturing and business operations, the facility includes in-house R&D, quality control and technical support. Powder coating has become the preferred finish for many product applications because it is both versatile and environmentally friendly. If you currently use, or are considering using powder coatings for your requirements contact Nortek for fast, personalized service. Nortek's unique manufacturing capability is geared toward efficient manufacturing and easily accommodates custom manufacturing of powder coating developed to meet your specifications and requirements. Batch-to-batch, customers will enjoy consistent color, gloss, appearance, mechanical properties and application. 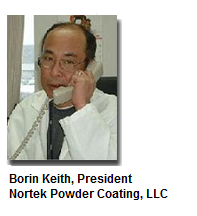 Founder and President Mr. Borin Keith is a powder coating industry insider with 30-years experience in marketing, product development, technical troubleshooting, and customer support. At Nortek Powder Coating, Mr. Keith has applied his extensive experience in powder coating to create a state-of-the-art production process that is unparallel in the industry in terms of efficiency and product quality. Regional Sales Manager Donovan Harrison leads the Southeastern Sales and Service Organization. Mr. Harrison has extensive experience in powder coating industry applications and provides direct support from initial product selection to after-sale technical support. Nortek products are available and supported throughout the U.S. and Canada. Standard products ship within 24 hours and custom typically ship within five days from our manufacturing plant located at 5900 Success Drive in Rome, NY USA. Nortek has a STRONG SALES AND SERVICE ORGANIZATION. Nortek Powder Coating is supported by a highly qualified sales and service staff that is committed to assisting each customer, regardless of size.